In two years, the legislature went from denial to doing something about the unsupportable costs of Georgia's prison system. The Georgia prison population is already plumetting, and will drop more. This makes a private prison in Lowndes County, Georgia an even worse business deal. If it ever opens, it probably will close. The state's prison population has jumped by more than a quarter in the past decade and officials expect the number of state inmates to continue to creep upward. Georgia has resorted to measures other than reducing the prison population to keep corrections spending under control. 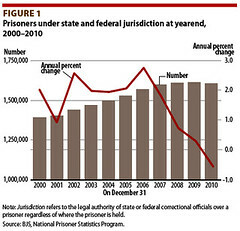 The Peach State had 49,164 prisoners under the jurisdiction of state and federal correctional authorities at the end of 2010, compared with 53,371 at the end of 2009. This represents a 7.9 percent drop. Click here for the full report, which breaks down prison populations by state, gender and race. 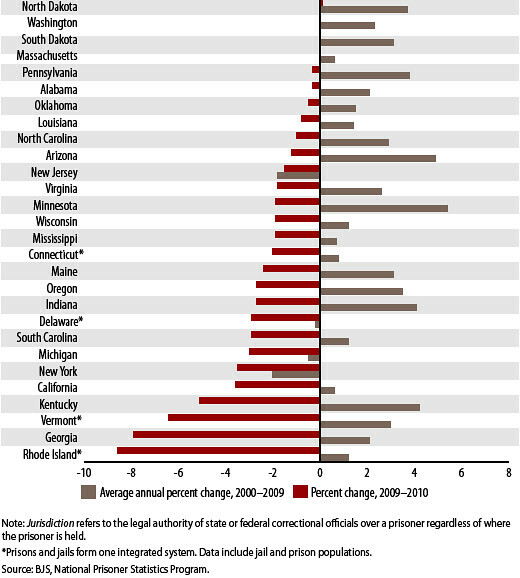 Only tiny Rhode Island managed to decrease by a larger percentage of prisoners from 2009 to 2010. This year, the Georgia Legislature is expected to begin considering a package of reforms intended to reduce the state’s prison population as well as the enormous costs to taxpayers that Georgia’s mass incarceration policies have caused year after year. The Governor named the Pew Charitable Trust and Applied Research Services as its consultants. Hm, those could be real consultants. Now that Georgia has finally gotten over denial about the symptom, how long until the legislature gets around to dealing with the cause? Georgia's antiquated and draconian marijuana prohibition laws are responsible for a large percentage of people in jail. "The war on drugs has failed miserably. We have casualties from this war filling homeless shelters, jails, and graveyards, as victim after victim is disenfranchised and denied any hope for a living wage," Denise Woodall, a PhD student in Criminology at the University of Miami who was formerly incarcerated, told Atlanta Progressive News. Currently the State spends more than one billion dollars annually on corrections, and this number keeps going up each year. The data shows most individuals sentenced to prison are drug and property offenders and they are staying behind bars for longer periods of time. These offenders represent almost sixty percent of all people incarcerated. Many of these people are identified as lower-risk and are less likely to re-offend. "They are saying [in the report] that there is no issue of public safety with these people; furthermore, they are admitting that they need help not incarceration," Woodall said. So why are we spending our tax dollars to lock them up? A majority of Americans now favor legalizing marijuana use. And even Georgia's law-and-order legislature is actively working on sentencing reform. So, why should we invest in a failing business? A failing business funded by our tax dollars? If you don't want a private prison, here's a petition you can sign to ask the Valdosta-Lowndes County Industrial Authority (VLCIA) to reject the CCA private prison from Lowndes County, Georgia. Or bring your car, truck, motorcycle, or bicycle to the motorcade against CCA Tuesday March 6th, from the prison site to the Industrial Authority office.